Plan of the Maiden Tower showing thickness of five meter walls. In Paris, it's the Eiffel Tower; In Moscow, St. Basil's Cathedral. Rome has its Parthenon; Athens, its Acropolis. And in Baku-the distinguishable architectural landmark is none other than the Maiden Tower. Azerbaijanis are incredibly proud of this monument that is shrouded in mystery and legend even though scholars and historians are unable to speak with absolute authority about its origins. Photo: Early sketch of Maiden Tower which was built into the walled defense system of Baku. There have been many fluctuations of the sea level of the Caspian Sea. It's totally possible that the sea lapped at the tower in the past although today it is about one block away. The heavy structure of the Maiden Tower is anchored to a rock that slopes into the sea. The structure is 16-16.5 meters in diameter and rises eight levels to tower above all the buildings of the old "Inner City" of Baku. Its architectural plan, seemingly so simple, consists of walls which at the base are extraordinarily thick, beginning at five meters in depth and gradually narrowing to four meters at the top. On the southern side of the cylindrical-shaped tower are relatively narrow niches about the height of a man through which the sun enters to illuminate the inner chambers. Rather curiously, there appears to be an external door that opens out to nowhere from the fourth floor. There is even a slot for a wooden spar, which seems to have served as a door-lock. But why on the fourth floor? Attached on the eastern side, jutting out towards the sea is a narrow trapezoidal-shaped construction whose function is not quite known. 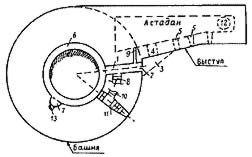 It is obvious that this projection does not serve to provide additional stability, nor as a breakwater, nor as resistance to thrusts of battering-rams and stone shots. Another mystery concerns the stone surface of the tower. Why is it hewn smoothly on the lower part of the tower and more roughly on the upper levels? Usually, scientists try to determine a structure's age by its calligraphy. On the Maiden Tower there is an inscription in Arabic which reads, "Tower of Masud, son of Davud." According to paleographic experts, the stone dates to12 A.D. However, according to A. Alaskarzade, a prominent expert in Arabic, the tower itself is much older and the writing itself dates to the 12th century, not 12 AD. The stones of the Tower are much darker than those of the inscription, which would support the view that the building, indeed, is older. Could the Tower have been repaired at some time and the inscription stone been introduced then? And if so, when and how was it ever damaged? Who knows? Left: One of earliest known photos of Maiden Tower from Baku Bay. Circa 1860s. Courtesy: Azerbaijan State Archives, Photo and Cinema Documents. Many legends surround the Maiden Tower. Most of them center around the word-"Maiden." A young girl, according to most versions, ordered the tower to be built and then either locked herself in, or threw herself from its heights into the sea below. 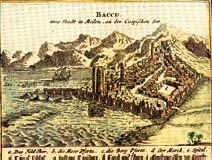 As the level of the Caspian Sea has experienced cycles of fluctuation-rising and falling-over the centuries, there is a strong possibility that at one time, the waves did lap at the Tower although today the sea is about a block away although it is getting closer and closer again. According to one of the most popular legends, it was a king, himself the girl's father, who fell in love with her and wanted to marry her. But the girl tried to delay her father's advances by begging him to build the tower and wait until it was completed. When he completed it, he had still not changed his mind. That's when she leaped into the sea. One variant even has a happy ending. After the Maiden casts herself into the sea, her lover avenges her death by killing the father only to discover that mermaids have rescued his maiden. Naturally, he manages to find her and get married. Culturally speaking, specialists believe that the fact that the story depicts a father wanting to marry his daughter probably indicates that the legend predates Islam. Prior to the occupation of Islamic rule in the 7th and 8th century, experts believe that power was transferred via female lineage in the region that now is known as Azerbaijan. To maintain these dynasties, it is believed that sometimes ritualistic marriages were arranged between brothers and sisters, and even fathers and daughters. It is this practice that may be reflected in these legends that surrounds the Maiden Tower. Regardless of their origin, these legends have become a favorite theme in the works of many Azerbaijan artists and poets. In 1923, the prominent Azerbaijani playwright Jafar Jabbarly wrote a poem entitled "The Maiden Tower". The first Soviet film made in Azerbaijan in 1924 and directed by V. Balliuzek, also based its plot on this legend. Afrasiyab Badalbeyli who composed the first Azerbaijani National Ballet (1940) used the tale though he added an ironic twist of mistaken identities on the part of both the father and the daughter. The father returns from war, angry that his wife has borne him a girl instead of a boy. He demands that the baby be killed but a wet nurse escapes with the child to raise it in a nearby village. Seventeen years later, the father chances upon the young girl and falls in love with her, not knowing that she is his daughter. The girl, already engaged, tries to repulse him. On the wedding day, her young fiancé kills the father and then runs up the Tower to rescue his Maiden. But he arrives too late. Upon hearing the footsteps, the girl mistakes them for her father's, not her lover's, and leaps from the Tower into the sea. This ballet is still being staged today. While the attention of artistic people has mostly focused on "Maiden" part of the name, archeologists have concentrated on the "Tower" aspect. In Azerbaijani, Maiden Tower is known as "Gyz Galasy" (gyz ga-LA-sy). The root, "gala" means "fortress." Some scientists have suggested that Maiden Tower belongs to the type of constructions that was erected for passive, not active, defense which enabled a segment of the population of the city, usually women, to hide themselves in times of dire emergency. Thus the name, "Maiden" Tower. It's estimated that 200-250 people could secure themselves inside the tower and withstand sieges, because of the thick walls, "canalization" (meaning pottery pipes), and a well that could be accessed from the third floor. Even were the ground floor occupied by the enemy, entry to the first floor could be blocked as there was no permanent stairway to it. 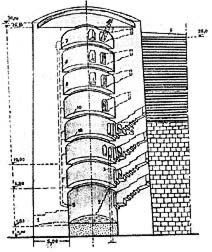 Cross section of the eight levels of Maiden Tower. But at the beginning of this century, an amateur historian made some calculations and discovered that the amount of stone and lime used in constructing of the Maiden Tower could have been used to surround the entire city if the purpose of the Tower was purely for defense. Besides, why would an enemy seize the tower when it would be very easy to smoke it out? Presently, the opinion that the Maiden Tower was built primarily as a defensive construction is not popular though one should not completely deny its defensive role as the remains of the fortress walls indicate that the Tower was built into the fortress wall when it was originally erected. "Fortress" is not the only clue one can gain from the linguistic root "gal." According to Vagif Aslanov, it often means "to build a fire" in Azerbaijani folklore. Thus it may be that the Maiden Tower was once a Zoroastrian Temple. According to lore, there were several Fireworshippers' Temples in Baku. The most popular theory to explain the existence of the Maiden Tower is that it was a sacred place for the Zoroastrians for their religious celebrations and sacrifices. According to the hypothesis of architect, Davud Akhundov, who dates the Tower to about 7-6 BC, seven floors of the Tower (excluding ground floor) symbolized seven main deities. The fireworshippers burnt fires in their honor in niches inside the Tower, at the entrance as well as on the top. The eternal fires were supported by natural gas which reached each floor through potter's pipes. Historian M. Nabiyev has another twist to the theory. He believes Maiden Tower was a Zoroastrian "Tower of Silence," where the dead were taken and placed on the roof to be devoured by ravenous birds. Zoroastrians did not bury their dead in the ground for fear of contaminating the earth. This theory suggests that priests would fasten the corpse, wrapped in rug, with ropes and lift it up to the roof of the Tower. However, bones of priests and nobles were carried to the fourth floor, which would explain that the architectural projection really served as an "astadan", a place where the bones of noble Zoroastrians were kept. In addition to these hypotheses, Iranian researcher Bastani Parisi associates the Tower with Anahit, an ancient Goddess of Water and Fruitfulness, who was revered by many people in the region. Historian Gara Akhmadov claims the Tower was an observatory. Despite how many theories there are to explain the Tower, no one has been able to say with absolute authority why it was built. Even the date of the construction of the Tower's age has been estimated to range between 7th century BC to 12th century AD-a range of time separated by nearly two millennia! There may be many mysterious towers on earth, but none quite compares to the Maiden Tower. Despite the fact that it has become the symbol of Baku and favorite place of tourists who like to climb to its roof to view the entire city, the building remains stubbornly silent, hiding its history, and thus the ancient past of Baku. Indeed, it is a real "tower of silence."